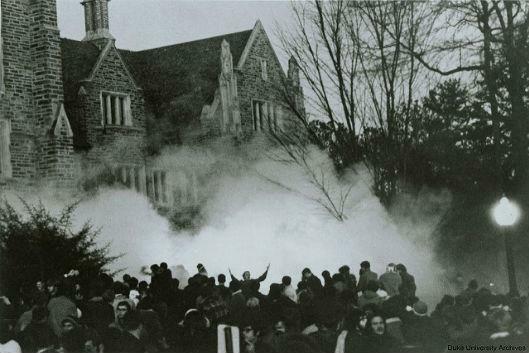 The original 1969 Allen Building Takeover protesters will reunite for a series of panel discussions to be held in the Ambassador Ballroom at the Washington Duke Inn. A reception and dance party will follow in the Nasher Museum of Art's Great Hall. For more information, visit https://aaas.duke.edu/abt50. NOTE: Due to overwhelming response the panel discussions will now take place at the Washington Duke Inn. The reception will continue to be held at the Nasher Museum of Art. This event is co-sponsored by the Office of the President, the Office of the Provost, Trinity College of Arts & Sciences, Duke Alumni Affairs, the Duke Black Alumni, the Duke Council on Race and Ethnicity, the Mary Lou Williams Center for Black Culture, and Duke University Archives.